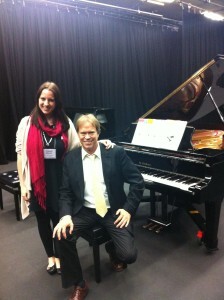 I had a fantastic week in Toowoomba recently at the Australasian Piano Pedagogy Conference (APPC). I had the opportunity to work with Randall Faber (pictured), author of the Piano Adventures series that I use with my students, and keynote speaker at the conference. As I will be working with Hal Leonard Australia as a brand ambassador for the Piano Adventures series, I was able to spend some time privately training with Randall Faber while he was in Australia, including a technique masterclass, many fascinating pedagogy discussions, and some great informal chats over meals throughout the week. I am thrilled to be working closely with Carly McDonald, of Novar Music in Adelaide, to represent the Piano Adventures brand and present at future workshops and conference ourselves. I also discovered a LOT of new music at the conference, and came home with an overflowing suitcase and 2 extra boxes of music! I am excited to start working on this fantastic new repertoire with students this term. I learnt a lot from the sessions I attended, and have some wonderful new technological resources to use in lessons, from iPad games to apps that provide backing tracks for improvisation work, and those that display music digitally and allow you to turn pages by simply tilting your head! I’m definitely looking forward to attending the 2015 APPC in Melbourne, and hopefully presenting at that one myself. For now I am booked to present at the REEFlections conference for the MTAQ in Cairns in July 2014, which I’m sure will be another excellent professional development weekend. This entry was posted in Uncategorized on July 20, 2013 by Thembi.